The owners of a Cornish hotel destroyed by fire have been fined £80,000 and ordered to pay £62,000 costs for failing to meet fire safety standards. 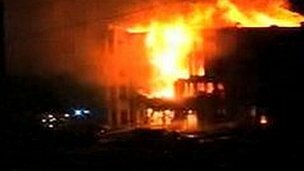 Three Staffordshire people died in the blaze at the Penhallow Hotel in Newquay in August 2007. In March O&C Holdsworth Ltd admitted failing to provide proper fire detection and alarm systems and failing to make a proper risk assessment. The company, from Halifax, Yorkshire, was sentenced at Truro Crown Court. Holidaymakers Joan Harper, 80, Monica Hughes, 86, and her son Peter, 43, died in the blaze, described by firefighters as the worst hotel fire in Britain for 40 years. Mr Hughes, a teacher from Cheslyn Hay, Staffordshire, jumped from a third-floor window after trying in vain to save his mother. Ms Harper, of Stoke-on-Trent, was also trapped, while her twin sister Marjorie Brys was one of more than 90 people who escaped the four-storey hotel. John Hughes, Mrs Hughes' son and Peter's brother, said after the case: "To say I am disappointed with it is an understatement, it is a travesty. "It should have been at least £500,000 in my estimation. I was hoping that a large fine would have sent a message to the hotel industry at least." The court heard that the company had been warned by Cornwall Council about inadequate equipment more than a year before the fire. Failings included the lack of an "L2" alarm system, which features loud fire and smoke alarms in every room. Judge Christopher Paul Darlow said the company was not responsible for the fire which an inquest heard was probably the result of arson. He also said it was impossible to say whether lives would have been saved if safety systems been up to scratch. But he said there had been a "systemic failure" by the firm to ensure its chain of hotels in southern England had complied with regulations. "This represents not just a one-off event but a systemic failure of this magnitude to illustrate the magnitude of risks present. "These matters had been raised in July 2006 but had not been addressed by the time of the fire 13 months later." O&C described the fire as a "tragedy" and said it had been left "devastated" by what happened. "Following the fire we immediately initiated a comprehensive review of our health and safety and fire safety procedures at our other hotels and have strengthened the company guidelines and working practices to ensure full compliance." An inquest into the deaths in 2009 returned open verdicts on all three victims.